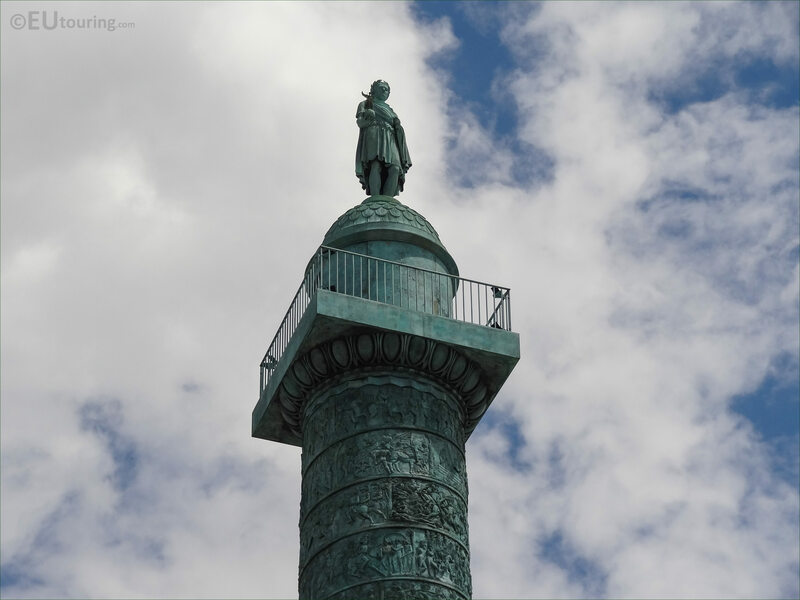 We were in the 1st Arrondissement of Paris at the Place Vendome when we took these high definition photos showing the Colonne de Vendome and the statue of Napoleon I, which was sculpted by Auguste Dumont. 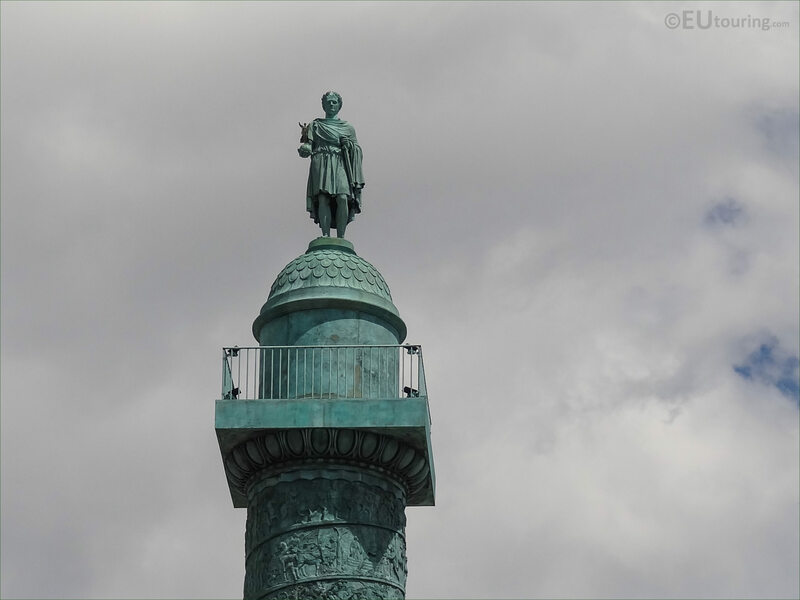 The Colonne de Vendome, or in English Vendome Column, was commissioned by Napoleon Bonaparte and was based upon the Trajan column of ancient Rome and it was designed to commemorate the triumph of the Battle of Austerlitz and a statue of Napoleon was placed on top, which was originally designed by Antoine-Denis Chaudet. 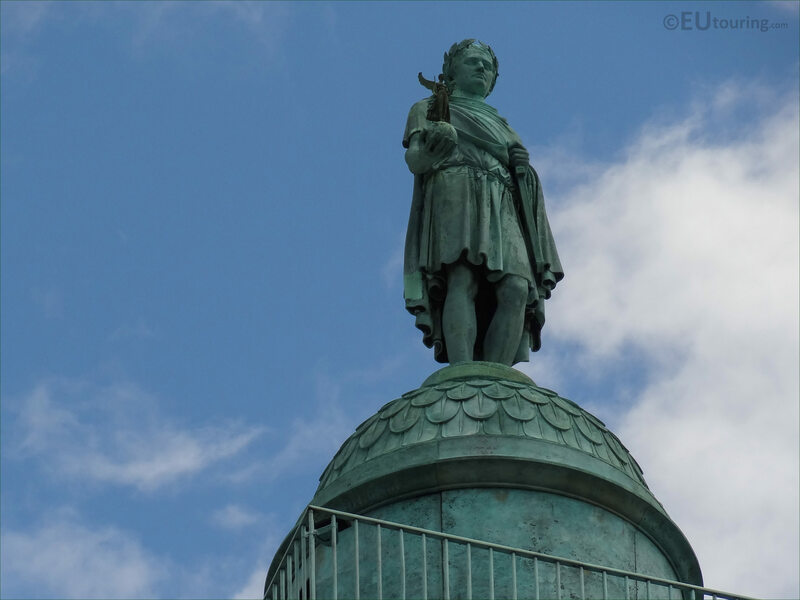 Unfortunately, this original statue was taken down in 1814 and melted in 1818, although the original Victory emblem that Napoleon was holding was fortunately preserved. Yet during the July Monarchy, when King Louis Philippe I of France was reigning, a new statue of the emperor was sculpted by Charles Emile Seurre but in uniform as a corporal measuring 3.5 metres, which can now be seen from the Cour d'Honneur at Les Invalides, which is the tourist attraction where Napoleon Bonaparte is buried. 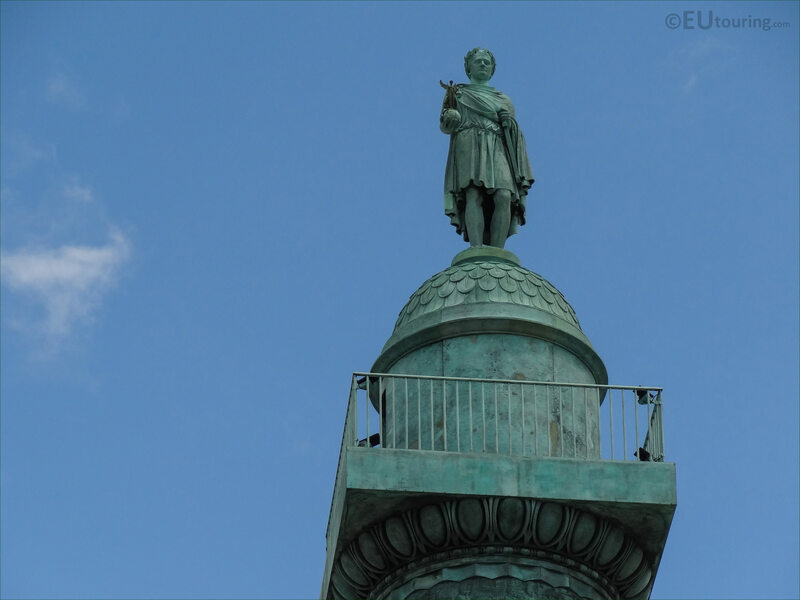 However, the statue you can see in this close up photograph is actually the third statue placed on the top of the Colonne de Vendome, which is also of Napoleon Bonaparte depicted dressed in Roman attire, as a copy of the original by Antoine-Denis Chaudet, and this also incorporates the emblem of Victory and the Globe beneath it that Napoleon I is holding. So this third statue of Napoleon I was actually realised during the French Second Empire when Napoleon III was in power, and it was produced by Augustin-Alexandre Dumont who was born in 1801, yet was always known as Auguste Dumont, and he sculpted this particular statue in 1863. Although, rather than the sword being carried in the right hand of Napoleon, it is now in his left hand, and he is holding up the globe with the victory symbol of a winged figure in his right hand, also wearing a crown as a laurel wreath on his head, which was used in recognition of victors during Roman times. 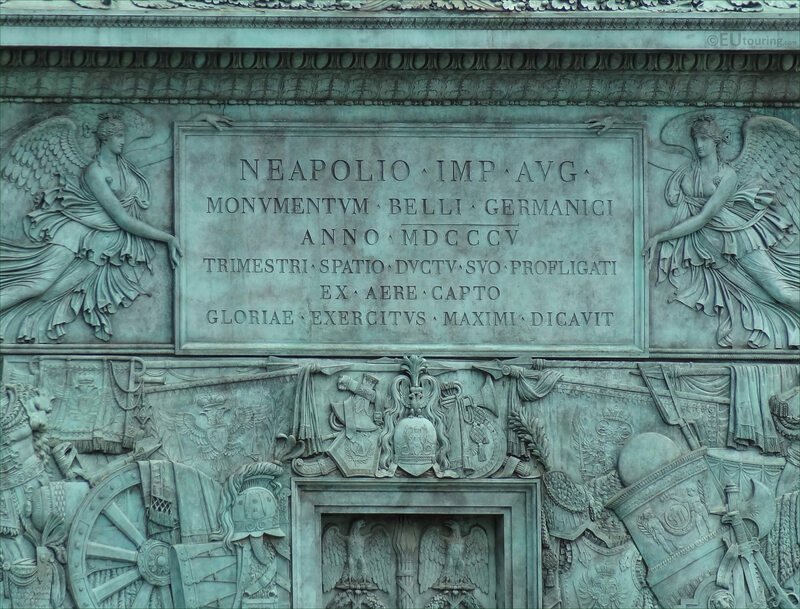 Napoleon Emperor Augustus consecrated to the glory of the Great Army this column formed of bronze conquered on the enemy during the war of Germany, won under his command in 1805 in the space of three months. 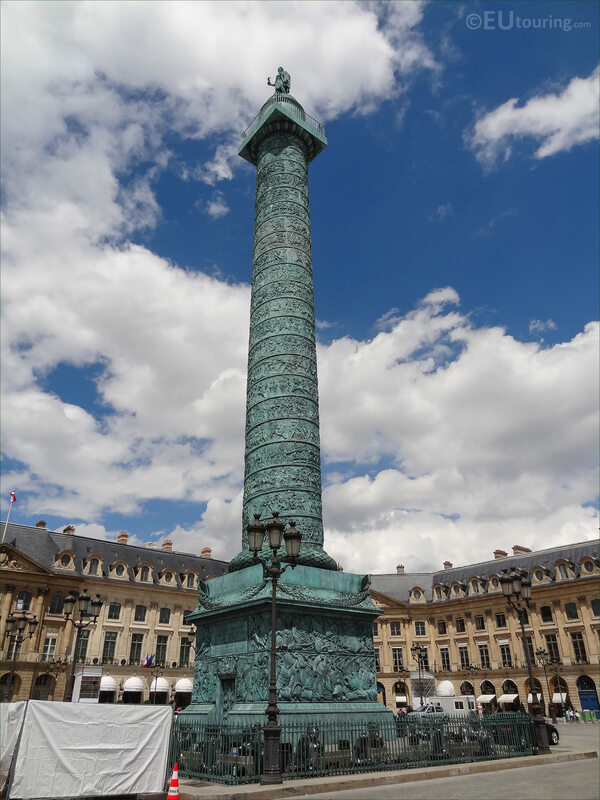 But during the Paris Commune in 1871 the entire Vendome Column and the statue of Napoleon I was taken down to be destroyed, however, fortunately is was not actually destroyed and by 1873 this was started to be reconstructed and finished in 1875, and has remained in place at the Place Vendome ever since, even though people cannot go up to the top of the column below the statue, like you were once able to. Yet this photograph shows the entire Colonne de Vendome that measures over 42 metres in height, and here you can see all the of the barrels that were made of stone drums then covered with bronze on the column itself, which were actually cast from canons seized during the battles Napoleon Bonaparte fought, and each one has reliefs depicting different battle scene that were produced by many notable sculptors of the time. Although the base of this historical monument in Paris was made from porphyroid granite that came from Corsica, which is where Napoleon Bonaparte was born within the capital city of Ajaccio in 1769, and with a restoration project between 2014 and 2015 that was financed by the Ritz Hotel, which is located within the square, the Vendome Column will be seen by tourists for many years to come.